Click on image or here for animation. Because of Earthâ€™s dynamic climate, winds and atmospheric pressure systems experience constant change. These fluctuations may affect how our planet rotates on its axis, according to NASA-funded research that used wind and satellite data. NASAâ€™s Earth Science Enterprise (ESE) mission is to understand the Earth system and its response to natural and human-induced changes for better prediction of climate, weather and natural hazards, such as atmospheric changes or El NiÃ±o events that may have contributed to the affect on Earthâ€™s rotation. Changes in the atmosphere, specifically atmospheric pressure around the world, and the motions of the winds that may be related to such climate signals as El Nino are strong enough that their effect is observed in the Earth’s rotation signal, said David A. Salstein, an atmospheric scientist from Atmospheric and Environmental Research, Inc., of Lexington, Mass., who led a recent study. From year to year, winds and air pressure patterns change, causing different forces to act on the solid Earth. During El Nino years, for example, the rotation of the Earth may slow ever so slightly because of stronger winds, increasing the length of a day by a fraction of a millisecond (thousandth of a second). Issac Newton’s laws of motion explain how those quantities are related to the Earth’s rotation rate (leading to a change in the length of day) as well as the exact position in which the North Pole points in the heavens (known also as polar motion, or Earth wobble). To understand the concept of angular momentum, visualize the Earth spinning in space. Given Earth’s overall mass and its rotation, it contains a certain amount of angular momentum. When an additional force acting at a distance from the Earth’s rotational axis occurs, referred to as a torque, such as changes in surface winds, or the distribution of high and low pressure patterns, especially near mountains, it can act to change the rate of the Earth’s rotation or even the direction of the rotational axis. Because of the law of “conservation of angular momentum,” small but detectable changes in the Earth’s rotation and those in the rotation of the atmosphere are linked. The conservation of angular momentum is a law of physics that states the total angular momentum of a rotating object with no outside force remains constant regardless of changes within the system. An example of this principle occurs when a skater pulls his or her arms inward during a spin (changing the mass distribution to one nearer the rotation axis, reducing the “moment of inertia,” and speeds up (increasing the skater’s spin); because the moment of inertia goes down, the spin rate must increase to keep the total angular momentum of the system unchanged. The key is that the sum of the angular momentum (push) of the solid Earth plus atmosphere system must stay constant unless an outside force (torque) is applied, Salstein said. So if the atmosphere speeds up (stronger westerly winds) then the solid Earth must slow down (length-of-day increases).Also if more atmosphere moves to a lower latitude (further from the axis of rotation), and atmospheric pressure increases, it also gains angular momentum and the Earth would slow down as well. Other motions of the atmosphere such as larger mass in one hemisphere than the other can lead to a wobble (like a washing machine with clothes off-balance) and the poles move, in accordance to the law of the conservation of angular momentum. Salstein looked at wind and pressure measurements from a National Weather Service analysis that makes use of a combination of ground-based, aircraft, and space-based observations. The measurements for the Earth’s motions come from a variety of space-based measurements including satellites, like those in the Global Positioning System (GPS), the geodetic satellites that included records from NASA’s older LAGEOS satellite, and observations of distant astronomical objects using a technique known as Very Long Baseline Interferometry. Understanding the atmospheric pressure patterns, moreover, is essential to interpret results from NASA’s Gravity Recovery and Climate Experiment (GRACE). 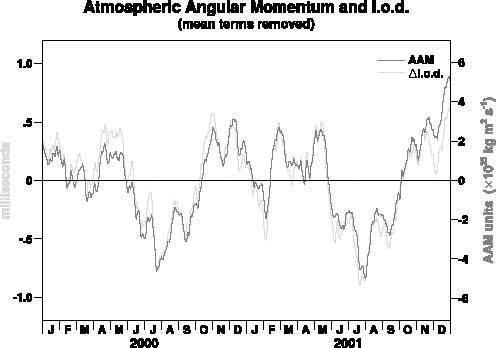 The fact that the two vastly different systems, namely the meteorological and the astronomical, are in good agreement according to the conservation of angular momentum gives us assurance that both these types of measurements must be accurate. It shows, moreover, that changes in climate signals can have global implications on Earth’s overall rotation. NASA’s ESE research focuses on the changes and variability in the Earth system, including atmospheric, oceanic, and geodetic areas. This research was recently presented at the annual meeting of the American Meteorological Society in Long Beach, Calif. This entry was posted in Climate Change, Earth's Rotation on 17 December, 2017 by Peacefull.